I am going to present the first example trading model in this series that exploits the characteristics of the NYSE Tick Index. Most people focus on the intraday behaviour of the Tick Index and forget that it is a great summary statistics tell us what is more likely going to happen the very next trading day. 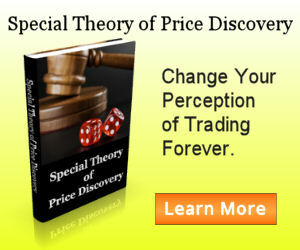 The example trading model Blind Short is a short only day trade model demonstrating this fact. Over the past 10 years, the model has generated more than $3,000 dollar profit annually on single lot, averaging less than 30 trades each year. Commission of $2.5 per trade per contract is taken into account. Special limited worst case analysis is used with 1 tick disadvantage so that we know the backtest result is a good baseline to measure from. Following chart shows the emini S&P continuous contract at the top pane, the NYSE Tick Index in the middle pane and the net dollar gain per contract with the Blind Short model in the bottom pane. The performance has been very consistent even with the raw model presented in the chart. It is interesting how such a simple trading model works so well all these years. LC, exactly what values are being averaged here, when you call for the “high prints”. Does this mean all prints of above a certain value … say 800 or 1000 or does it mean that highest print for the session? Thank you, sir. You are a scholar and a gentleman. 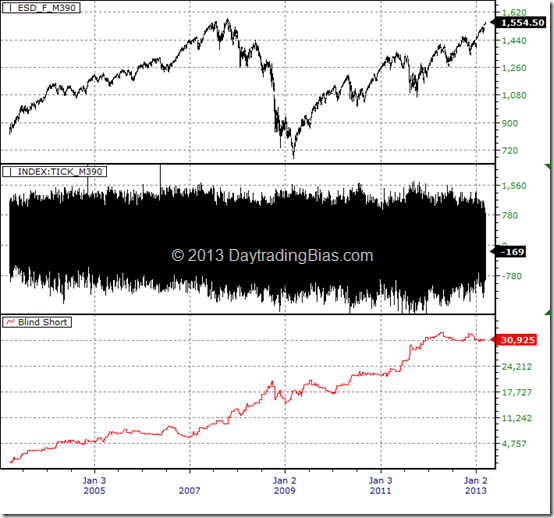 This article shows that there are bias in the tick index that are obvious and usable / tradable. Upcoming ones will be more complex and I think I will have to include formulas and code. I am not sure what you mean by “16 ticks principle”. Nowhere in this article mentions anything like that. Are you talking about the S&P Tick16 Index? Custom breadth data generation for the construction of Tick16 and other real-time breadth data can only be done with NeoTicker. It is the only platform where retail traders have access to that can construct custom market breadth in real-time. NeoTicker does not “trade” the custom breadth data it collects, it is the job of the trader to utilize the information. I’ve already have some custom breadth signals integrated into the real-time trading assistant tool. More breadth based trading setups will be integrated in the future.